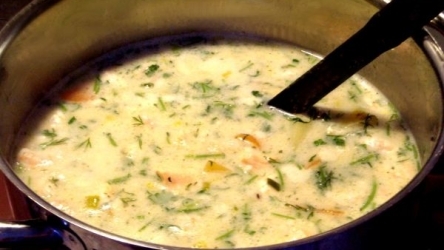 Laxsoppa is a Swedish food recipe of salmon soup. For the stock, cut the salmon trimmings into small pieces, rinse in cold water, place in a casserole, cover with cold water and bring it to a boil. Skim carefully, then add the vegetables and the spices. Let it simmer for 45 min, then strain the stock. Remove and set aside any salmon meat adhering to the head, tail or bones. 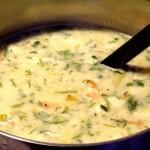 For the soup, melt the butter in a deep, heavy pan over low heat, add the flour while stirring, then add the salmon stock. Bring to a boil and let simmer for 15 min. Whisk egg yolks and cream, add the mixture to the soup, followed by salt and pepper (if desired). Add the vegetables and any salmon meat that could be removed from the trimmings and serve hot.